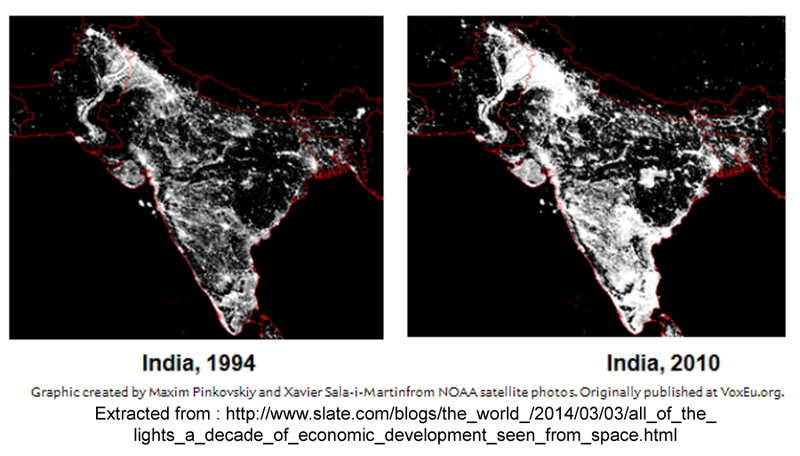 I got these two satellite maps of India’s change in night luminosity from 1994 to 2010 from the slate.com site after airing my comments in my previous blog about the alleged growth and development of Gujarat State under Narendra Modi. I didn’t design the relative maps; nor was the blog site I refer above designed to show the comparative growth rates in India. Actually, Southern Africa was the focus of that blog. Night luminosity, viewed from a satellite, is a good, though probably not the best, indicator of the degree of electrification and hence, albeit roughly, of the material development of a country, countries or states within a country. You can see that the so-called cow belt of the North, as expected, has shown little progress barring Delhi and Punjab, and that the “development” in Gujarat is restricted to the parts where it was already developed by 1994. Of all the 35 states and Union territories listed, Modi’s Gujarat, almost coinciding with his chief ministership of the state, stands half way down the line of development. Wikipedia says that the richer states in India have achieved 100% rural electrification. However, Gujarat, as at the close of 2013, had not achieved this feat while 9 other states – Andhra Pradesh, Delhi, Goa, Haryana, Karnataka, Kerala, Punjab, Sikkim and Tamil Nadu – have. If you watch the figures of industrial growth, GDP growth, per capita GDP and all such figures that are indicative of the economic development (too large broadsheets to reproduce here), you would find that Gujarat had never got ahead of other states during the last 12 years. On the other hand, states like Uttarakhand and Bihar had fared far better. So what Gujarat Model is Mr. Narayana Murthy talking about? Make a lot of noise about development and people, even the so-called experts, would believe you. For some time. Time enough to cause trouble. I have read so many posts regarding the blogger lovers but this piece of writing is actually a fastidious piece of writing, keep it up.